Our asset base is comprised of approximately 99.7% conventional gas and oil producing assets. Our wells produce from shallow-depth, vertical wells into low permeability reservoirs sitting above the prolific Marcellus and Utica shale plays of the Appalachian Basin. These mature wells benefit from simple and low-cost maintenance operations and require low ongoing capital expenditures. The wells show low decline rates with little water content, resulting in a long average well life of ~40 to 50 years. The characteristics of our assets earn us a high-quality and reliable stream of free cash flow. 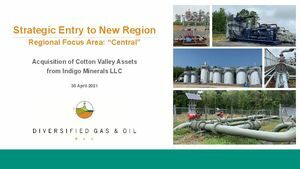 We have developed a niche for adding value to our assets through proven and engaging processes developed by our key personnel and our on-the-ground leadership team. As such, our field operation teams take a precautionary approach to wellhead compression management, fluid load deduction, pumpjack optimization, and other techniques developed within our “Smarter Well Management” program. We maintain our objective to extend the life of our wells and limit the rate of depletion of our assets. Since inception, we have drilled 150 wells across our portfolio, none of which have been dry holes. The vast size of the land bank means that the assets have only been sparsely drilled presenting an infill drilling opportunity that we will seek to exploit in a higher commodity price environment. As the wells are onshore and shallow, development wells are relatively cheap and quick to drill. By leveraging our scale and cost efficiencies, we have demonstrated our ability to maximize value for our stakeholders and will continue to do so as we execute our growth strategy.